Posted by Nicole Richards on Tuesday, September 29th, 2015 at 12:32pm. When families are engaged in a child’s learning experience students achieve more, further research suggests that when a father figure are involved in their education, students perform better academically have fewer behavioral and discipline problems and are also more responsible. 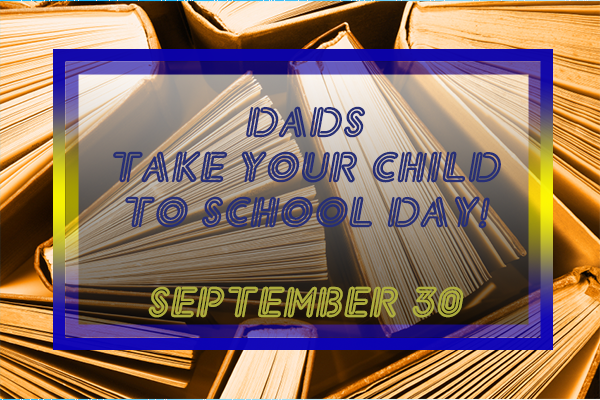 That is why South Florida is participating in the inaugural day: Dads Take your child to School Day which is on Wednesday, September 30, 2015. On this day, Florida’s Elementary Schools are encouraged to invite all fathers, step dads, Grandfathers, Uncles, Foster parent, big brothers or any other significant male role models to take your child to school and participate in brief, yet meaningful activities. The Florida Department of Education recognizes the vital roles that schools and families play throughout a young child’s life and educational career. This is just one way Florida Schools can deliberately engage father figures in our schools and classrooms. And as a result, Florida students will be more successful now and in the future!